March 24, 2014, 9:24 PM · Metronome, that nine letter word that strikes fear (and slight annoyance) into the hearts of students everywhere. At some point throughout your studies you’ve probably been told that you need to use a metronome. You go home, turn it on, and after about five minutes you have the urge to throw it out the window. So, how do you use a metronome to effectively help you in practice? 1. Invest in a good metronome. There are a few things to look for when you purchase a metronome, the most important of which is an adjustable volume control. Nothing is more frustrating or counterproductive than trying to play along with a click you can only hear intermittently. The second thing to look for is a metronome that offers basic subdivision settings. You don’t need to buy something as fancy as a Dr. Beat, but having at least eighth note, sixteenth note and triplet subdivisions is extremely helpful. 2. Start simple and build. If you have never worked with a metronome before, choose a simple scale, set the metronome to a relatively slow tempo (i.e. the quarter note equals 60) jump in and don’t give up. Don’t expect yourself to line up with the click the first second or even third try. It will take time for your hands to adjust to the click, remember you are in essence training yourself to play along with another “person”. The key is to keep trying until your bow and left hand both fall in sink with the metronome. As you become more comfortable with the metronome begin incorporating it into more complex and difficult things. I often encourage my students who are using the metronome for the first time to gradually integrate it into their daily practice, as it is a new skill, which takes time to learn and refine. 3. When you learn a new piece, use the metronome from day one. This applies to students who already have a good working foundation with the metronome. It’s not the most exciting or glamorous thing, but using the metronome from day one can save you a lot of time. It prevents you from rushing or dragging the tempo, helps you line up rhythms, solidify articulations and bow division and prevents you from taking time for technical issues that hinder the phrase. It’s gritty painstaking unforgiving work, but if you do it from day one you will prevent yourself from learning incorrect habits that take even more time and energy to unlearn. 4. You can still phrase while using a metronome. This one took me a lot of time to come to terms with in my student days. I was always one of those students who felt the metronome cramped my “natural musicality” and phrasing. I never believed my teachers when they told me using a metronome could help me create a more solid phrase, and at times I could even “steal” time and give it back in the next measure without missing a beat. I fought long and hard, and finally I realized I was one of those students who thought they were creating deep musical phrases, but in reality was a sloppy rhythmical mess creating awkward phrase points and tempo variations wherever I had a technical deficiency that wouldn’t allow me to phrase in time. Speaking from experience, I can tell you that it is possible to create beautiful phrases while the metronome clicks away. Before you can take time you have to know how to be in time, and how to articulate all your musical intentions, phrasing and colors in time. By doing this, you create a solid framework from which you can occasionally wander away from, but which you will always know how to come back to. 5. Know when to turn the metronome off…and back on again…and back off. While it is important to work with the metronome when you practice, it is equally important to know when to turn it off. After you have a solid working foundation with a piece, it’s important to turn the metronome off and see where you are at. Remember the metronome is there to guide you; you don’t want to become dependent on it. If you never turn it off you’ll never learn how to develop your own internal pulse. After working intensely with the metronome turn it off and work without it for a while. Try to feel and hear the click running in your mind even though the metronome isn’t on. Be self-aware and correct any unplanned variances from your intended tempo. You have to learn to feel, be aware of and internalize the beat without the metronome guiding you, and this is another skill, which will take time to develop and refine. After you have worked without the metronome for a while, turn it back on and work with it again and then turn it back off; keep repeating this processes until you feel confident and comfortable. March 25, 2014 at 09:17 AM · Just to let you know that I used to dread practicing with a metronome, but now I can't play without it. March 25, 2014 at 06:28 PM · Good post. More students probably feel they DO fall "in sink" rather than 'in sync' with the metronome at first. It's a great tool, a poor crutch, and you write well about it. 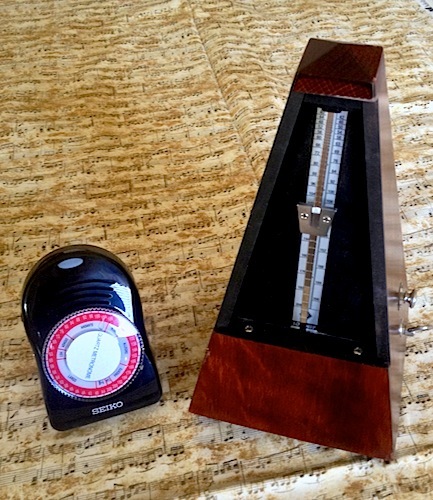 March 25, 2014 at 07:49 PM · I am borrowing a mechanical metronome and am considering a purchase. Having used digital metronomes, I prefer the acoustic sound of a Wittner wooden wound product. Thanks for the post, I use the metronome to build muscle memory and as an accompaniment for banjo and fiddle. March 26, 2014 at 03:44 PM · Good catch Marjory, I’m glad you enjoyed the post. Next time I will take greater care to sync my thoughts and grammatical articulation more accurately. I don’t want people to associate the metronome with feelings of despair, nor with practicing in the kitchen sink.